Four companies that lost patent rights in America Invents Act challenges have bet their final appeals solely on a possible Supreme Court decision that the challenges are unconstitutional. Affinity Labs of Texas LLC, Depomed Inc., Hillcrest Laboratories Inc., and Paice LLC filed petitions asking the high court to put their cases on hold pending the outcome in Oil States Energy Services, LLC, Petitioner v. Greene’s Energy Group, LLC, No. 16-712. They made no arguments on the merits of the underlying patent invalidity ruling. Several more similar, bare-bones requests to piggyback onto the constitutionality issue in Oil States—a dispute over the validity of a hydraulic fracturing patent—are likely before the Supreme Court finally rules sometime in the spring of 2018. The court will hear arguments in Oil States this coming fall or winter. For the four companies, it’s a gamble, because they won’t get another chance to defend their patents’ validity. If the high court rules in Oil States that AIA proceedings are not unconstitutional, claims that were previously judged to be invalid will be canceled. The petitioners are appealing rulings by the U.S. Court of Appeals for the Federal Circuit on invalidity from the Patent Trial and Appeal Board, an administrative tribunal tied to the Patent and Trademark Office. Patent owners have 90 days to file a petition from the date the Federal Circuit affirms a PTAB invalidity ruling. In the last two months, the Federal Circuit has ruled on more than 30 other cases where an AIA challenge is involved. And the court is not hanging onto cases pending a Supreme Court decision. On July 19, the court denied Smartflash LLC’s motion for a constitutionality-related stay in a high-profile case on patents—canceled in an AIA proceeding—that were allegedly infringed by Apple Inc.'s iTunes and Google Inc.'s GooglePlay. However, having more than one question in a petition on a statutory or constitutional issue—rather than the merits of the patent owner’s case—could boost petitioners’ chances of success at the high court, Pedersen said. On the constitutionality side, for example, “there are 5th and 14th Amendment due process issues on a wide range of procedural shortcomings of the proceedings,” Pedersen said. Also, in specific cases, universities have successfully claimed 11th Amendment states rights immunity, such as in NeoChord v. University of Maryland, Baltimore , he said. Patent owners contesting losses at the PTAB during the months prior to the Supreme Court’s Oil States decision should preserve all related issues, Pedersen said. “Make sure that there are some kind of constitutional, jurisdictional and/or standing challenges raised in the record, at least on appeal to the Federal Circuit,” he said. No Help for Earlier Losers? The AIA enabled the popular inter partes review (IPR) proceeding that allows alleged infringers and others to contest the validity of a patent before the PTAB. Typically, the alleged infringer is a defendant in federal court. Before IPR became available in 2012, an infringer had to make its arguments against a court’s presumption that a patent was valid. The AIA eliminated that hurdle. An IPR petition presents prior patents and other documents to prove the patent either non-novel or obvious, where the documents were either not found or inadequately analyzed by the original examiner. The PTAB conducts the proceeding without the presumption of validity. On June 12, the Supreme Court granted Oil States Energy Services LLC’s petition for review of the question of whether patents are private property that can only be taken away in a jury trial conducted by a federal court. If the answer is yes, any company challenging the PTAB’s patent cancellation decision on constitutional grounds will get its patent rights restored and then fight it out with the alleged infringer in a district court. 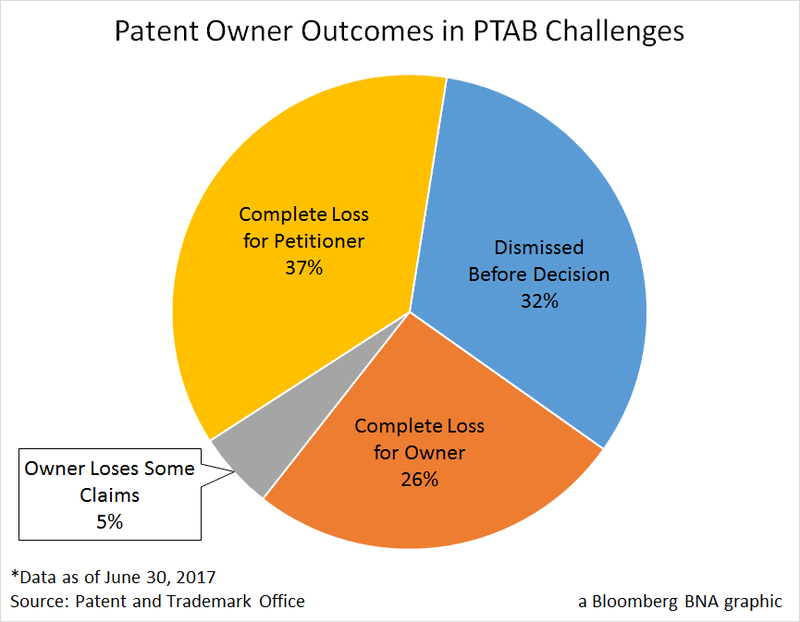 But the PTAB has canceled at least some claims in as many as 1,300 patents in prior rulings. Those patents owners, if they’ve exhausted appeals, may not have an option to restore those rights. Pedersen believe a Supreme Court unconstitutionality ruling wouldn’t have retroactive effect, but Macedo was not so sure. However, Macedo gave patent owners another path even if the Supreme Court rules that IPRs are unconstitutional and indicates that the decision is not retroactive. And if the ruling goes the other way, Pedersen suggested there will still be plenty more legal issues for future patent rights losers to raise. He said that interpretation of the 1952 Patent Act was still clarified 45 years later in the Markman case on claim construction, and 55 years later on obviousness in KSR. “The Court will be dealing with a host of issues relating to AIA review proceedings for decades to come,” Pedersen predicted.